David Phillips studied organ at the Royal Academy of Music in London, England. During this time, he was awarded the Fellowship of the Royal College of Organists (F.R.C.O.) and, by virtue of achieving distinction in final year playing examinations, he was presented for and received the prestigious Recital Diploma (Dip. R.A.M.). He also received prizes for performance, accompaniment and improvisation. An Arts Council bursary financed study of the Symphonies of Louis Vierne with David Sanger (UK), and he has received further organ tuition from Peter Hurford (UK), Naji Hakim (France) and Jacques van Oortmerssen and Ewald Kooiman (The Netherlands). 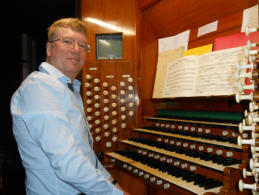 A master of a wide repertoire, David has given recitals in the UK, Canada and the USA at many illustrious venues, including: the Cathedrals of St Paul’s, Truro, Bristol, Portsmouth, Chichester, St Edmundsbury, Coventry, Birmingham, Sheffield, Bradford, Chester and Newcastle; Westminster Cathedral; Westminster Abbey; Blenheim Palace; Halifax Minster; in Oxford, Exeter College, Magdalen College and The Queen's College; in Cambridge, Great St Mary’s; in Scotland, St Giles’ Cathedral and Greyfriars Kirk, Edinburgh; in Montreal, Christ Church Cathedral, St Matthias’ (Westmount) and the Church of St Andrew & St Paul; in Toronto, St James’ Cathedral and Yorkminster Park Baptist Church; in Boston, King’s Chapel; in New York City, St Thomas’ Church, Fifth Avenue, and the Church of St Mary the Virgin, Times Square; Washington National Cathedral; and in California, First United Methodist Church, San Diego, and the Cathedral of St Mary of the Assumption, San Francisco.